I had never heard of Yoho National Park until I started researching our trip to Canada. 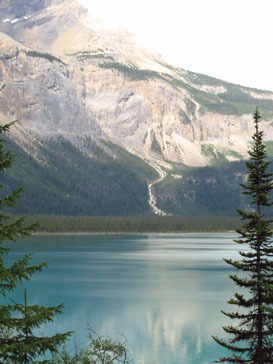 When I learned that Yoho is the Cree word for amazement, I knew we’d have to go there. 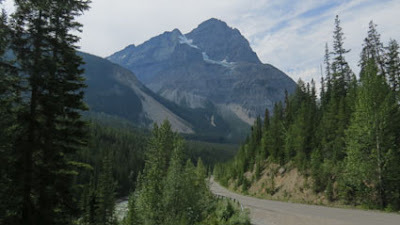 Located in British Columbia on the western slopes of the Rockies (Banff National Park, which borders Yoho to the east, is in the province of Alberta), Yoho is accessed by the Trans-Canada Highway. Created in 1886, it’s the smallest of the four contiguous national parks in the Canadian Rockies, but it can hold its own with breathtaking waterfalls, ice fields, lakes, and general ruggedness. For hearty outdoor enthusiasts, it offer fabulous hiking along the186-mile trail system. Yoho is just 17 miles from Lake Louise, so we planned a day trip to hit the highlights that are accessible from the road. If you want to visit the area around Lake O’Hara, possibly hiking the shoreline or other lakes in the back country, you must take the shuttle bus on a road closed to the public. Visitors are limited in order to protect the natural resources, so reservations must be made months in advance. Since our time was limited, we opted to tour in our car and take shorter hikes to notable sights. The first stop was at Spiral Tunnel Viewpoint and KickingHorse Pass National Historic Site. 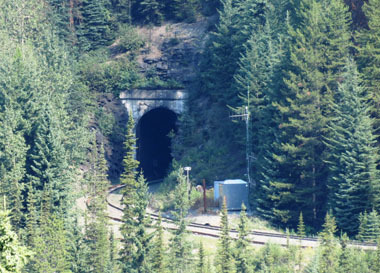 Spiral tunnels through the mountains were completed in 1909 and reduced the original railway grade of 4.5 percent (steepest of any railway in North America) to a safer 2.2 percent. The Yoho River, fed by the Wapa Icefield to the north, flows through the narrow valley and converges with Kicking Horse River in a powerful splurge of waters coming from two separate cascades. Much of the park’s natural beauty has evolved from these rivers. Takakkaw Falls is definitely magnificent. When we turned off the Trans-Canada Highway onto Yoho Valley Road, the character of our sightseeing drive changed dramatically. This challenging road rises steeply from the valley with several tight switchbacks (no trailers allowed on the road). It ends at Takakkaw Falls, the most impressive waterfall in the Canadian Rockies. 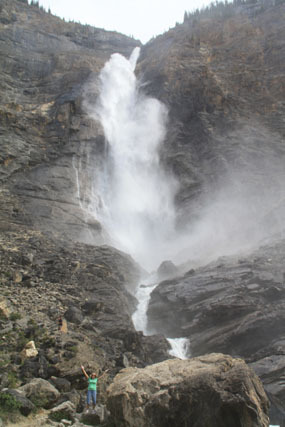 Takakkaw, which means magnificent in Cree, roars 850 feet over a sheer rock wall at the upper edge of the Yoho Valley, creating a spray felt a hundred yards away. Walking to the base of the falls, the temperature dropped noticeably as we got closer, and the wind blew stronger. Multiple layers of water tumbled over rocks and cliffs , and folks who didn’t mind getting soaked could climb to a large rock outcropping for an excellent photo op. Yoho Valley Road took us back to the main highway and on towards Field, the only town with facilities and supplies in the park. Less than two miles west of Field we stopped for another intriguing sight—Natural Bridge. 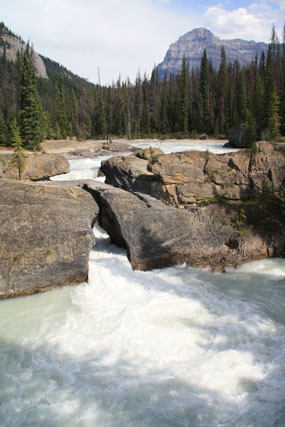 Here, Kicking Horse River has worn a narrow hole through limestone creating an arched bridge over rushing water. Eventually, the force will wear away the rock and create a waterfall. For now, it’s a worthy stop, just to admire the powerful water from the man-made overlook bridge. Still, we couldn’t resist walking –carefully—onto the rocky precipices for better photo opportunities of the mighty waterfall. Emerald Lake is one of the prettiest in Canada. After a brief stop at the Visitor Center in Field, we drove Emerald Lake Road to see stunning Emerald Lake while enjoying a late picnic lunch. Surrounded by a spruce forest and tall mountain peaks, the lake was very crowded on Sunday—until a brief rain shower cleared out most visitors. Then it was truly peaceful and pretty, a wonderful place to walk along the shore admiring abundant flowers, mountain reflections, and sparkling water—attributes that make Yoho a popular park for those in the know. What a beautiful article - brought to life by some great photos. Thanks for sharing!